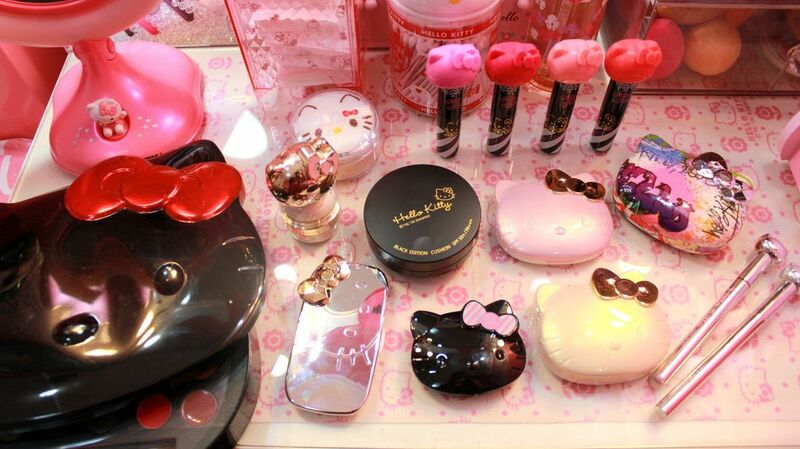 Real Asian Beauty: Hello Kitty Collection and Hello Kitty House Tour!! Hello Kitty Collection and Hello Kitty House Tour!! Meow! Do you love Hello Kitty? 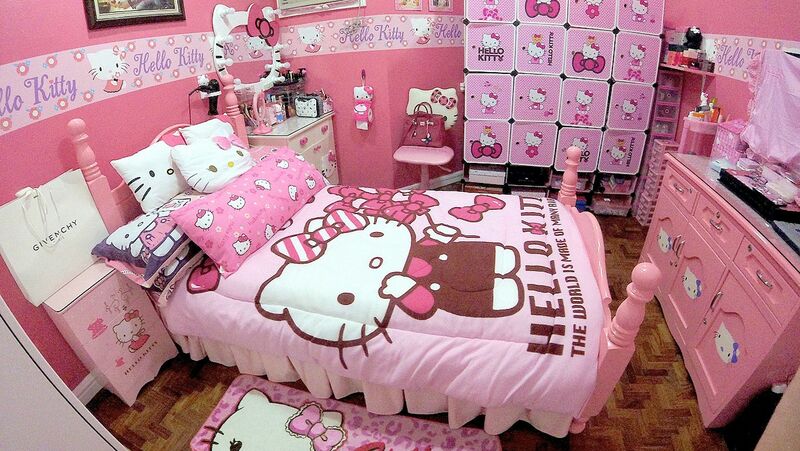 You will surely love to see this HUGE Hello Kitty Collection! Hello Kitty is really cute! I mean, she's a cat (or a girl) and she's pink! What else can you ask for? My friends know that I have been following a Hello Kitty collector on Instagram for years. I used to show them her account and tell them how much Hello Kitty stuff she has. I don't really remember how it started but we just ended up talking on Instagram through direct message. She also told me watches some of my vlogs! One day, I sent her a message and I asked her if it would be possible to meet her since I really want to see her in person. Of course, I asked her if I could also see her huge Hello Kitty collection. Fortunately, she said yes! I had the privilege to visit her at her home! I got to meet her and her family plus got to see her Hello Kitty babies. Prior to my visit to her house, I asked her if I could take few videos of her collection so I could share it on my YouTube channel! Watch the video below to see her HUGE HELLO KITTY COLLECTION!! By the way, her name is Jen. 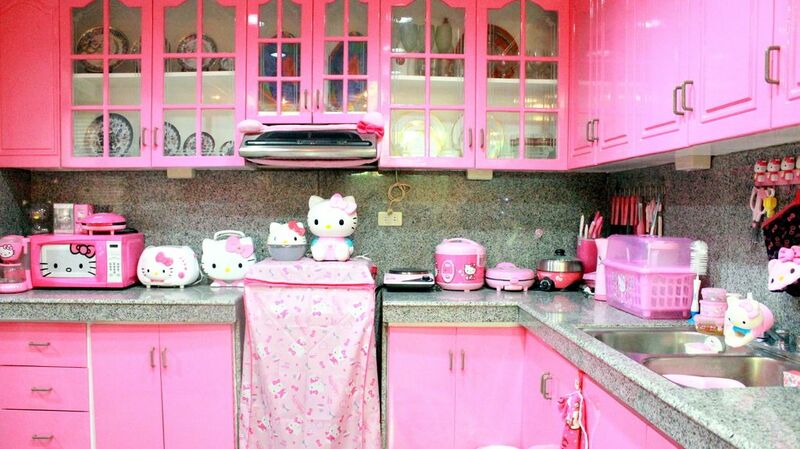 You could see her entire Hello Kitty collection by following her on Instagram @Princess_Kitty_Jen! 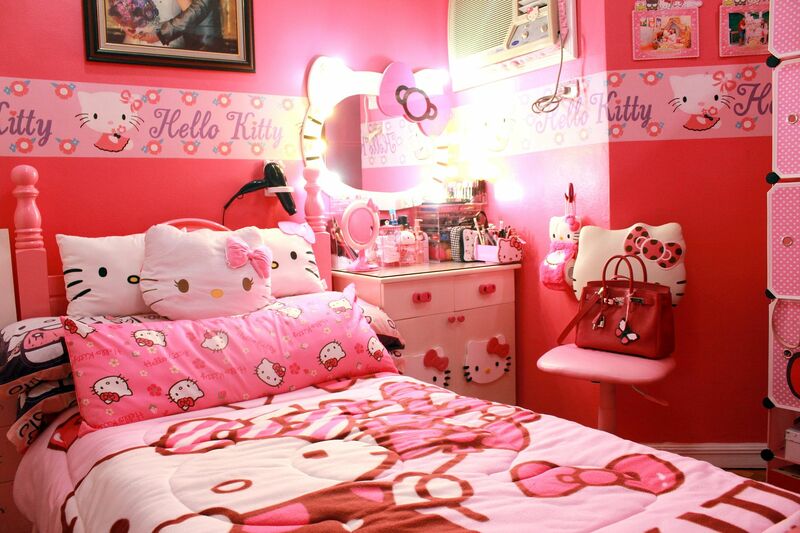 First, let me show you Jen's Hello Kitty-filled bedroom! This is what she mostly shares on her Instagram account. So, I pretty much had an idea how the bedroom looks. But I was still amazed when I saw it in person! Her room was a bit cramped but it was filled with Hello Kitty! She has Hello Kitty starting from the rug, cabinets, comforter, pillows, swivel chair, drawers and her entire collection of Hello Kitty makeup, bags, cameras, clothes, shoes, perfumes, watches and accessories!!! But what I loved most about her room is her Hello Kitty Vanity table and Hello Kitty Mirror with lights and her Hello Kitty Swivel chair! I also got to see her Hello Kitty makeup collection, which are not cheap, I tell you! They are available at Sanrio, Sephora, Japan and Singapore! Next, I got to tour her Hello Kitty Theater room filled with Hello Kitty stuffed-toys and collectibles! This is where she keeps her small Hello Kitty stuff. 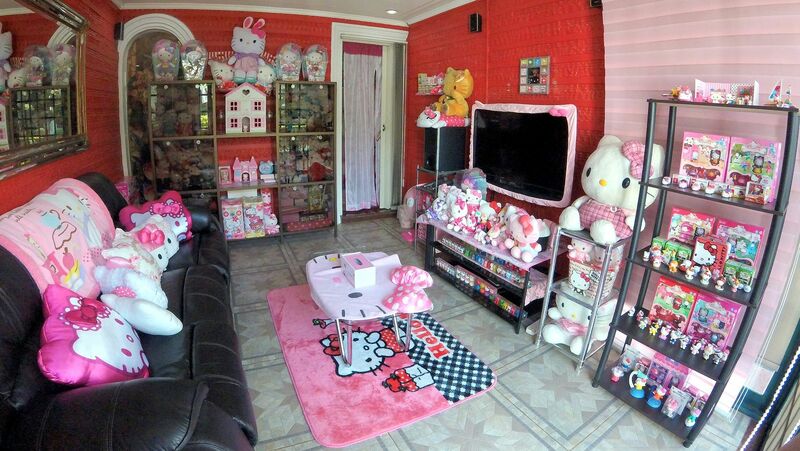 I'm pretty sure it would take someone an entire day to look at or to count all the Hello Kitty staying in this room. This also is where she keeps her "prized"Hello Kitty possession. She has 3 Hello Kitty cards personally hand-signed by Yuko Shimizu, the creator of Hello Kitty from Japan! I got to see her cute kitchen where she has all sorts of Hello Kitty kitchen appliances from soy sauce dispenser, rice cooker, waffle maker, bread toaster, microwave, humidifier, kitchen tools, and even a Hello Kitty REF!! Annnnd one of my favorite parts! Her Hello Kitty bag collection!!! I wouldn't mind not owning any of her other Hello Kitty stuff but I would really love to own a Samantha Vega Hello Kitty handbag! The first time I went to Singapore, I searched for a Samantha Thavasa store! I wanted to buy one for myself! But, I held back when I found out how pricey these bags are! Well, one costs around Php 8,000/$160 per bag so it's not THAT expensive. But I thought I wouldn't be able to use a Hello Kitty handbag all the time so I opted out. 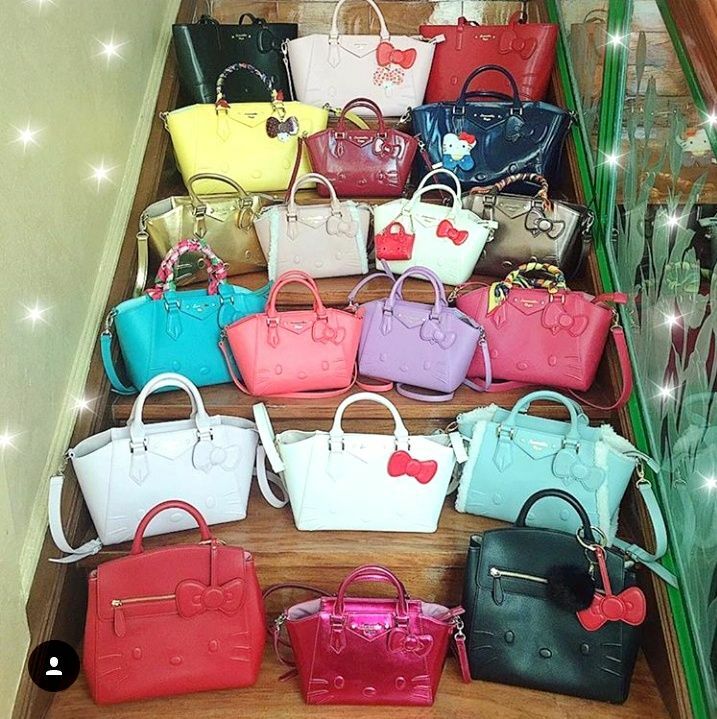 I am still amazed how much Samantha Vega bags has! She's really so blessed! Look! A giant Hello Kitty! She told me this was a gift from her husband for Valentine's Day a few years back. It's not available anywhere, though, as her husband just had this custom-made just for her! Aww, a loving and thoughtful husband and a huge Hello Kitty? One lucky woman, I say! 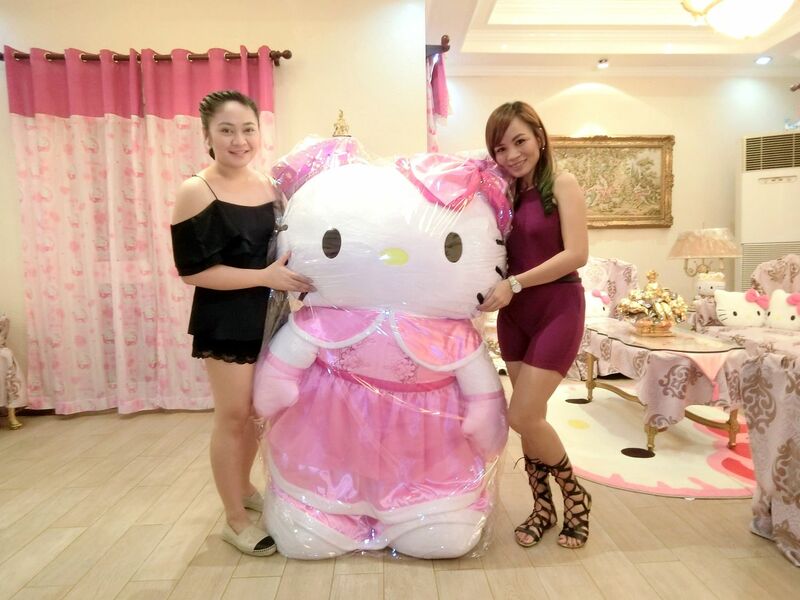 After the fun house tour, she invited me to come with her to Hello Kitty Cafe in SM North EDSA! I have been wanting to go to that cafe, too! They sell all sorts of cute cakes, macarons and pastries! One would feel hesitant to take a bite into that cute cupcake, really! Especially if it has cute Hello Kitty face or bow topper. Jen treated me to some Hello Kitty sweets! I got to taste Hello Kitty Cafe's Kitty Macarons and Kitty Cake! It was really fun touring Jen's house and going through her Hello Kitty stuff. I finally saw why she's so blessed. It's because she is so sweet and kind in person. I'm not saying this just because she let me visit her house. I am saying this because that's what I saw when I met her. I am happy I finally met someone I've been following on social media for years already. If you want to see the rest of her collection, go ahead and follow @Princess_Kitty_Jen on Instagram! Of course, please don't forget to follow me @RealAsianBeauty on Instagram for more cute and pink stuff. Check out my other videos and hauls on my YouTube Channel REALASIANBEAUTY.